LGBT. I'm sure this has been put on here before, but something really bothered me so... re-appear, awesome poster thing. :D. Wallpaper and background images in the LGBT club. 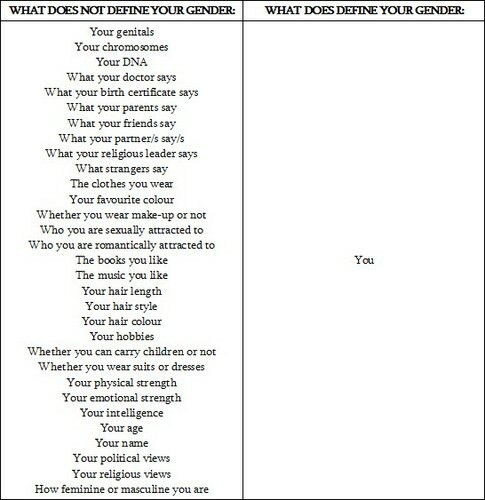 You can not pick your own gender and deside which one you are. You are born a boy or a girl, you can not change that. Weither you feel like a boy or not, you are a girl. Weither you feel like a girl or not, you are a boy. If you're a boy and want to be with a boy, I have no problem with that! But you shouldn't go changing what you were born into. That's actually similar to what people say about gays- they choose and they change. They (most, not all of course), were born the gender they feel they are. Physically they may be male, but in every other sense mentally they're female. Physicality doesn't always link with mentality. There are transgendered people who've tried to change just like gays try, and naturally they fail and feel miserable. Sometimes people focus way too much on the physical side rather than what's actually going on. People are incredibly diverse, who's to say that they aren't what they say they are? Especially if we ourselves haven't gone through it ourselves. pumpkinqueen: But some people feel like a man in a women's body, or versa vice, I fully support people that want to change their gender, in fact a girl I went to school with is going the whole "I don't feel like a women" thing and if she wants to dress and act like man then who am I to judge. You don't understand what they are going through. You know little about their opinions and views on their gender. Yes, I know that it is perfectly fine for one to love someone that is their same gender. But it is also fine for someone to want to change their gender. I'm going to quote something that someone once told me: "I hate it when my mother used to comment on someone's weight. If it doesn't effect you directly then their weight is none of your business." Now let me paraphrase. The fact they wish to be opposite the gender that they currently are does not directly effect you. So don't let it bother you. It's their body, and their soul. It's their life and not yours. I fully support gays, I can respect those you think like that. But I just do not like that idea of that, I just don't. I can't wrap my mind around it and I just don't like the idea of it. I'm not going to call them crazy, because they're not. Just...I just can't get it, you know? It's just the one thing I can never understand. I'm not trans. Honestly, I don't know anyone that is. But I run an LGBT Facebook page and I meet so many different people through it. You said "I can't wrap my mind around it and I just don't like the idea of it." Look, you don't have to be able to understand it or get the way someone trans thinks. I'm not sure I understand that way of thinking either. But you just have to accept it. Please don't be transphobic. They get it a lot harder than cis people, because there are so many people who just can't accept it. On a positive note, I'm glad you're not homophobic but there's a difference between being gay and being trans. Your right! People should be able to be themselves and not be ridiculed!